Rice urged to support independent investigation. 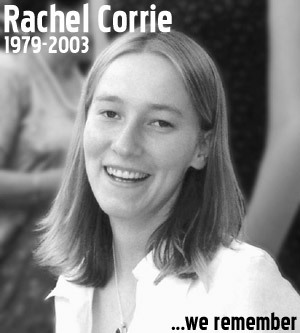 Washington, DC - Observing the two-year anniversary of the killing of Rachel Corrie on March 16, 2003, Amnesty International USA (AIUSA) today called on Secretary of State Condoleezza Rice to support an independent investigation of her death. Corrie, a US citizen, was apparently trying to stop the demolition of a Palestinian building in the Rafah refugee camp in the Gaza Strip when an Israeli army bulldozer ran her over, crushing her to death. Amnesty International believes that investigations into Corrie's death, conducted by the Israeli Defense Forces (IDF), failed to resolve contradictions between the official IDF position and eyewitness testimonies. Although this year's Department of State Country Report on Human Rights Practices for Israel agreed, stating bluntly that "U.S. officials who have seen the IDF report found inconsistencies among the statements of the people involved in the accident and other witnesses," there is no indication that the US has sought further investigation of these inconsistencies. While the US government has assisted in the investigations into cases of US citizens killed by Palestinian armed groups, it has failed to do so in Corrie's case, raising the appearance of a double standard. "An American citizen was killed two years ago and the US government notes the inconsistencies in the reports to date, yet it has failed to insist on a thorough, fair and impartial investigation," said Marty Rosenbluth, AIUSA's Country Specialist for Israel, the Occupied Territories and the Palestinian Authority. "Secretary Rice should demonstrate a willingness to act on her Department's conclusions by promptly supporting a new inquiry with the assistance of US law enforcement agencies." Amnesty International continues to call for an investigation into the wounding of Brian Avery, a US citizen who was shot in Jenin on April 5, 2003. Avery was seriously wounded when Israeli troops opened fire on him, despite the fact that he reportedly had his hands up and was wearing a vest that identified him as an international worker. Avery recently brought his case to the Israeli Supreme Court seeking to force an investigation after previous attempts to get the Israeli government to investigate failed. Amnesty International has consistently condemned violations by all parties in the tragic cycle of violence that has killed and injured thousands of civilians. The organization recognizes that the Israeli government not only has the right but the obligation to ensure the safety of its civilians, but reiterates that the use of force be conducted in accordance with international laws and norms. The failure to fully investigate deaths and prosecute those responsible is contributing to a culture of impunity and perpetuating the cycle of violence in the region. Seattle - The parents of a 23-year-old activist killed while trying to prevent the demolition of a Palestinian home is suing Caterpillar Inc., the company that made the bulldozer that ran over her. The federal lawsuit, which lawyers said would be filed here Tuesday, alleges that Caterpillar violated international and state law by providing specially designed bulldozers to Israeli Defense Forces that it knew would be used to demolish homes and endanger people. 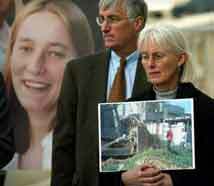 Rachel Corrie, a student at The Evergreen State College in Olympia, was standing in front of a home in a refugee camp in Rafah, near the Egyptian border, in March of 2003 when a bulldozer plowed over her. "The brutal death of my daughter should never have happened," Corrie's mother, Cindy Corrie, said in a statement released by the Center for Constitutional Rights, a law firm handling the case. "We believe Caterpillar and the (Israeli Defense Forces) must be held accountable for their role in the attack." Caterpillar spokeswoman Linda Fairbanks said the company had no comment on the lawsuit. However, the company released a general statement Tuesday that said: "Caterpillar shares the world's concern over unrest in the Middle East and we certainly have compassion for all those affected by political strife. "However, more than 2 million Caterpillar machines and engines are at work in virtually every region of the world each day. We have neither the legal right nor the means to police individual use of that equipment." The statement did not refer to the lawsuit. The Corries have filed separate claims in Israel against the state of Israel, the Israeli Defense Ministry and the Israeli Defense Forces. The Israeli military classified Corrie's death as an accident.